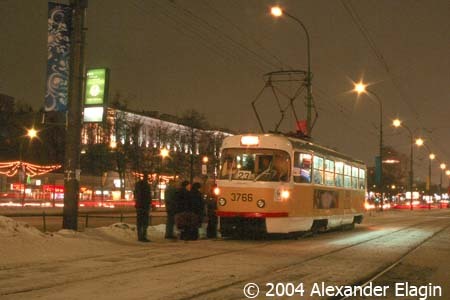 The following photos were taken on the last day (more precisely, late night) of tram service in Leningradskiy Prospekt - 24 December 2004. The line was suddenly closed because of construction works on a new highway intersection and its future is still not known. Currently, most tracks and overhead remain in place. Large billboards informed the commuters about the closure. 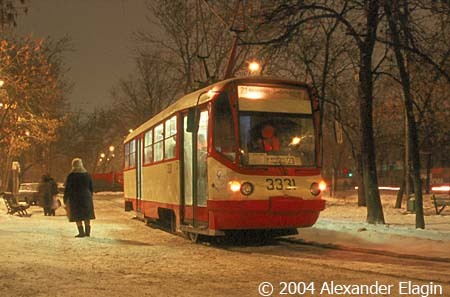 Tatra T3 is waiting at the terminus in Botkinskiy Proyezd. The evening rush hour is almost over, and there are not too many passengers in the tram, although one could hardly find a free seat there. 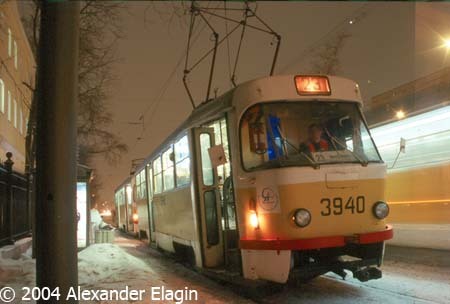 Tatra T3 #3980 at the traffic light before entering the terminus. A set of two Tatras at "Young Pioneers Stadium" stop. The building visible in the left part of the photo once was a tram station (very long ago - it was built in 1944 but used for other purposes for decades) but it got completely rebuilt in 2004. It is not very easy to enter a crowded tram at Aeroport metro station! Tatra T3 #3766, again at Aeroport. This stop has a convenient transfer to a metro station, that is why many commuters used to exchange here. 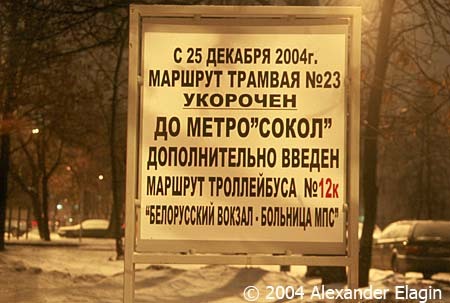 Another stop at another metro station - Sokol. The stop was located just a few metres away from the metro entrance, unlike the currently functioning one at Alabyana Street terminus - in fact, it was the next stop from this one. Again, this convenient transfer point is lost with the line's closure. 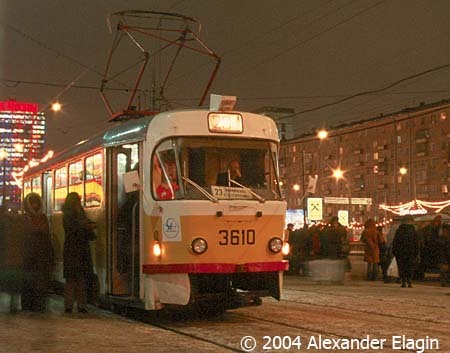 If there were double-ended trams in Moscow, the line in Leningradskiy Prospekt could still be operated, even without the final link to a reversing loop in Botkinskiy Proyezd. The line could terminate by stubs with a crossover on one side and use a part of the existing but currently unused tracksge in Alabyana Street loop, as shown on the following diagram. Sorry, the legend is in Russian, but I think the idea is understandable: curent situation is shown in red lines, possible shuttle service - in blue. 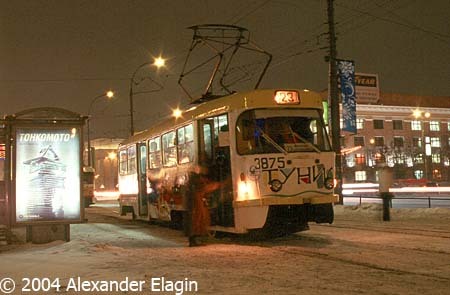 But in reality there are no such trams in Moscow, and the figure will remain nothing but my fantasy. 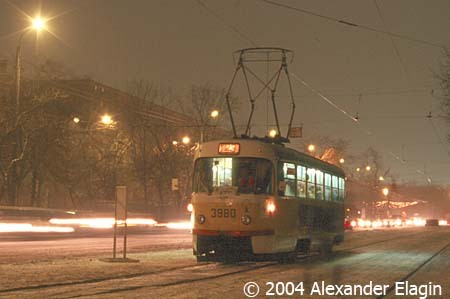 Frankly speaking, the possibility of 'home-making' a double-ended tram was discussed but got rejected by obvious reasons - getting all required technical approvements would take a few months, and anyway by the end of 2005 it will get clear whether the line would be restored or be closed down for ever.